Do You Know if You Are a Sales Leader? In my work with salespeople, I’ve noticed that there are some indicators if someone is genuinely a sales leader. 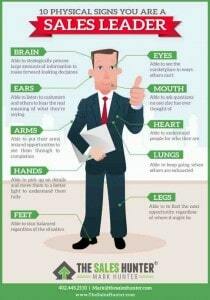 I recently put together a visual that highlights 10 Physical Signs of a Sales Leader. This is a fun and insightful way to pinpoint the skills you are doing well — and the ones where you still need to grow.